Where there is sap, surely syrup will follow at Somerskogen! The inaugural event of our new propane evaporator occurred on Friday, Mach 22nd. A few hiccups of function (not recognizing a low pressure reset, tweaking a float box to properly function and managing huge amounts of condensation) delayed the start of our evaporator until early afternoon. Once operational, the power of a 1.2million BTU burner was realized. We had sap boiling within 10 minutes and our first syrup made within an hour! The automatic draw off was fun to watch and we hope to include a video of its operation with our next post. We have been getting sap flows of 0.5-0.7 gallons per tap per day. We continue to look for leaks in lines or fittings to maximize the vacuum pressure. We know that every one inch of vacuum over 20 increases sap yield by 10%. We are not yet at that level. Many of our older fittings have micro leaks which require attention. The forecast looks very favorable and could determine the overall success of our season. Since the last post, we have finished putting in all the taps and hooked up the releaser where the sap flows into the final tank, deep in the woods. 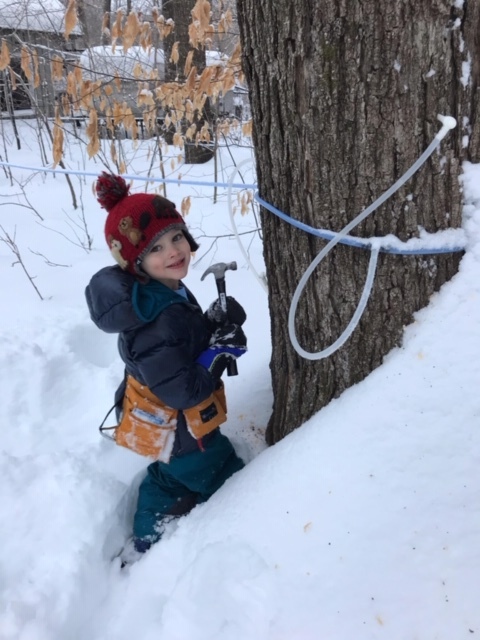 We estimate having 1050 taps - up a little bit from previous years.We're hopeful the deep snowpack, increased number of taps and improved tubing configuration leads to a banner year of maple syrup production. It looks like we may not see much sap flow until the third week in March - quite different than the past years. Though we will have a warmup this week and rain the temperatures cool down again for many days. At this rate, we may be making maple syrup the end of April! A record amount of snow fell in February and we had another 5- 6" last night - we're running out of room to put the snow! March is also our third snowiest month. Let's hope Minnesota has a gradual thaw or there will be significant flooding.